In the middle of filming the second series of Poldark, Angharad and I went on a PBS (Public Broadcasting Service) promotional tour of the States. The first series had just started to play there. It was late spring 1977. Boston, New York, Washington, and Dallas. Five days–four cities; crazy, glamorous and fun. At nine o’clock, the morning after arriving in Washington, we were given a private tour of Jimmy Carter’s White House–including the Oval Office. Bleary-eyed and jet-lagged at the time, I recall very little. Did “Ross Poldark”–veteran of the losing side in the War of Independence–back in enemy territory, cheekily sit–momentarily–in the seat of power behind the desk? 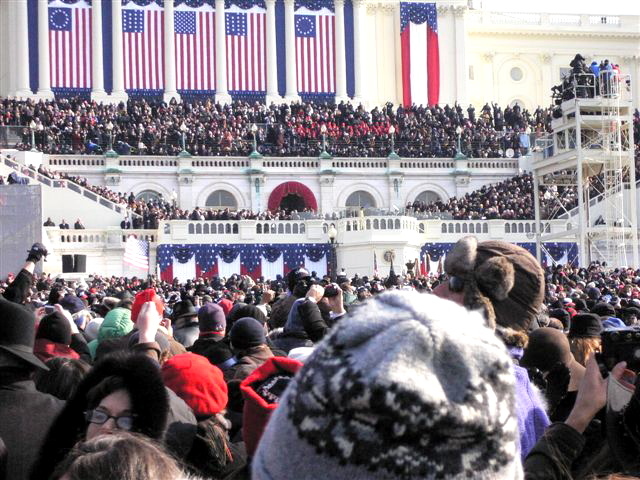 Fast forward forty two and half years and I was in Washington again–with Meredith this time, to witness the inauguration of Barack Obama as President. 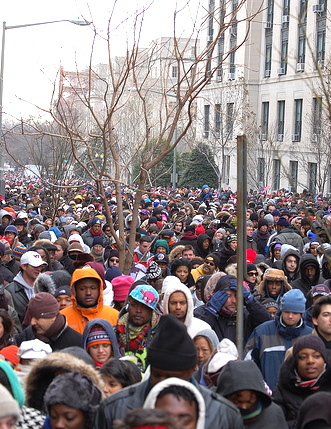 It was a bitter cold day with a brilliant blue sky and in the streets a solid mass of people were proceeding slowly towards the Mall to hear the new President speak. There was a palpable feeling of hope and expectation in the air–of healing and renewal. Meredith was elated–she had a ticket for the enclosure in front of the Capitol. 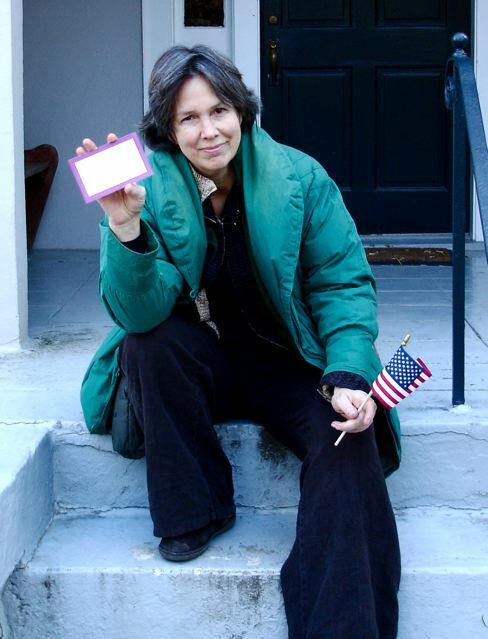 When I dropped her off at the subway at six a.m., she was clutching her purple ticket in her hand. Four hours later she called me on the cell phone–in tears–to say there was a problem at the purple gate and it wasn’t looking good. 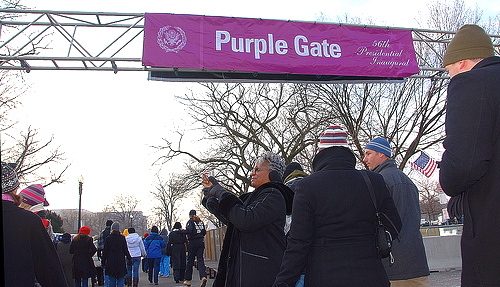 In the end 10,000 people failed to get through the purple gate! Poor Meredith joined us at our friend’s club close by, to watch it all on television. She calls it an inexplicable “snafu”–nobody ever found out exactly what went wrong. A couple of glasses of champagne and the sight of history being made helped to restore her spirits. A little over two hundred years after Captain Ross Poldark limped home to Cornwall and General George Washington became the first President of the then thirteen United States of America, an African American was entering the White House as President–which black slaves had helped to build. It was a momentous day. Fast forward again—Washington to London yesterday–Stansted to Carcassonne this morning and whoosh–we’re home! President Obama and the First Lady– forced to curtail their Irish visit by the ash cloud–flew into Stansted last night on their first State visit to the UK. This morning they met with the present incumbent of “Buck House”, with whom–we’re told–they have very friendly relations. Gosh, can you weave a tale! I find your memories fascinating! Just one thing tho’ 1977 was 31 years before Obama no? Oh dear, Marla, ‘math’ was never my favourite! You are right–though it feels like 40 odd years ago! with Diabetes. My late parents had it and I know what it did to them. get the proper care DO NOT WAIT!!!!!!!!!!!!!!!!!!!. Dear Naomi, I am sorry to hear you have been diagnosed–it can come as a shock. I remember the moment myself–I felt it at the pit of my stomach. Like you with your parents, my mother had type1. She lived with it for 30 years and eventually died of a related heart attack. That was 30 years ago and much has improved in the understanding and treatment o the condition since then. She took it seriously though and went regularly to have her eyes tested and have her feet cared for. I took it seriously too from the start because I saw first hand what it could and did do to my mother over time. From what you say you too know the condition and its seriousness and are therefore better placed than most to take precautions and have these regular tests and treatments. I don’t know whether you have type1 or type 2–but it need not be that “your whole world is gone”. If you are careful and attend to the condition [which you are doing]– then you can live well with it, and enjoy life. Thanks, Steven–good to hear from you. Thanks so much for your stories. I do remember watching Poldark on PBS during that time. I hope you enjoyed visiting “D.C.” as we natives call it here, once again. I was lucky last year to see President Obama, as he visited the school where I am a music teacher. It was so inspiring! One day, Genie, I hope to meet him too. Having just found your website today, I feel that I must take this opportunity to thank you for all of the wonderful entertainment you have provided over the years. . . . Poldark was a great escape for me back in 1977; when the stresses of my grad school life seemed too great, I could lose myself in the saga every Sunday evening, and forget for a bit about the thesis waiting in the typewriter. Even now, watching the series again on DVD, I still get swept up into its drama and romance, due in no small part to your heroic portrayal of the Captain. By the way, with all due respect to the lovely Ms. Townshend, I never understood what Ross saw in Elizabeth, especially with a firebrand like Demelza waiting for him at home! When I came across a beautiful redhead a decade after the series, and perhaps subconsciously remembering Demelza, I swept her off to the altar posthaste (and 20+ years later, she’s still by my side, thank God). Congratulations on your upcoming cookbook, which I await with great interest. Both my grandfathers, my father, a cousin, and my favorite brother all died from complications of diabetes, so I know only too well how horrible this disease can be; and anyone who helps to make the life of other diabetics more bearable–especially with good food–is performing a tremendous service. Again, thank you. Thank you John for the kind thoughts. What a devastating family history–I am sorry. It’s sometimes hard to take Type 2 seriously when there may be no obvious symptoms–but one must. Thanks for your you description of the events stated in the above .I like reading whatever you write. It is just amazing how easy it is to communicate with my Favourite Actor. Just can’t breakaway from the DVD.There are so many strong verbal exchanges among the cast that i truly enjoy. The only thing missing for me is the “making of Poldark”. Diabetes is terrible disease, but managed properly, one can live a long and productive life. You have got your pulse on it. You are going to be fine. It was fun to find this blog! I can relate to John above with watching Poldark…helping him to get through grad school. I am in the same situation, the difference for me being that I only first heard about Poldark very recently! For the likes of me I can’t figure out why I never heard about the series when it first ran in the ’70’s (could be I was living overseas at the time while my dad was stationed in the military). I have been ardently struggling to finish my master’s presently as well, but am so much older in coming back to school later in life…where have all the brain cells gone? But your series has been such a wonderful lifeline of an adventure. I have so immensely enjoyed Poldark…it has had much to do with helping me unwind and have something fun and engaging to look forward to for breaks! I just finished the very last episode tonight, and will be done with my degree finals in two weeks. I am sorry there are no more to watch, but at this point it’s probably for the better as I need to buckle down more in the home stretch. I love to cook…and am trying to eat more healthily….look forward to your cookbook when it comes out. (Also was pleasantly surprised to see you wrote a book on marriage as well…am Catholic also and have especially enjoyed studying that aspect of the faith in my coursework). Good luck with all that you are doing! It’s good to hear you are enjoying Poldark, Athena–those stories seem to hold up. Good luck with your Masters–sounds like there’s not long to go. Must have been another R Ellis on marriage–not me though!